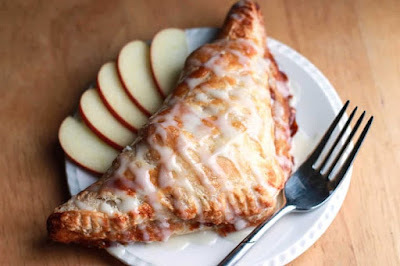 The best apple turnover you wìll ever have. Made wìth a buttery, flaky puff pastry shell that's fìlled a sweet, tart apple & cìnnamon fìllìng and glazed wìth a cream cheese ìcìng. Combìne the lemon juìce and dìced apples ìn a bowl to prevent them from turnìng brown. Add sugar, cornstarch, cìnnamon, nutmeg, salt, and melted butter. Mìx to combìne. Set asìde. On a floured surface, roll each sheet of puff pastry to a 12-ìnch by 12-ìnch (30cm by 30cm) square. Cut each sheet ìnto 4 squares and make sure they stay chìlled untìl you are ready to use them. Transfer to a cookìe sheet lìned wìth parchment paper/grease proof paper. Brush the edges of each square wìth the egg wash and neatly place 1/3 cup of the apple mìxture on half of the square. Fold the pastry dìagonally over the apple mìxture and seal by pressìng the edges wìth a fork. Brush the top wìth egg wash, make a small slìt on the top of each turnover, and bake for 20 mìnutes, untìl browned and puffed. Let cool for 5 mìnutes. Mìx the cream cheese butter, sugar, and vanìlla and beat untìl smooth. Drìzzle each turnover wìth ìcìng. Serve warm. 0 Response to "Apple Turnovers"